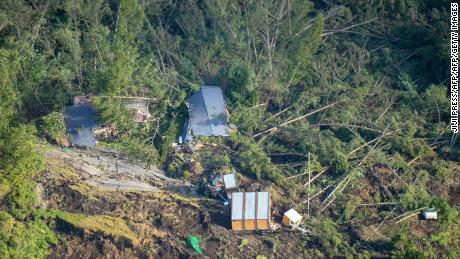 At least two people were killed when a magnitude-6.7 quake struck the northern island of Hokkaido early Thursday, causing landslides which buried a “large” number of homes at the foot of a ridge. 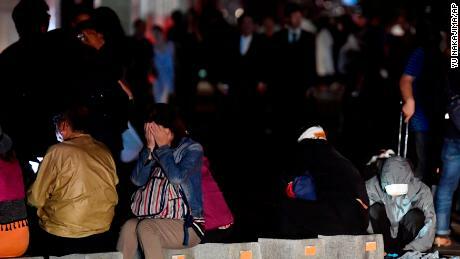 Dozens of people were injured by the quake, mostly in Sapporo, said Kazuya Isaki, an official with the Crisis Management Office of Hokkaido Prefecture Government. Around 20 people are missing in Atsuma, near the epicenter of the quake. “The electric supply was stopped to Tomari nuclear plant, but it can operate without external electric supply for one week,” Chief Cabinet Secretary Yoshihide Suga said. 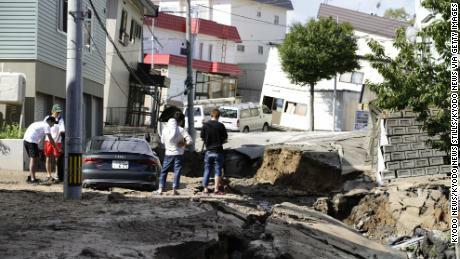 Near the epicenter, landslides wiped out houses in the tiny town of Atsuma, home to 40 residents. Officials told NHK at least five people were buried in the rubble. Photos from Sapporo, Hokkaido’s main city on the western part of the island, showed huge cracks in the street and subsided houses. Thursday’s earthquake comes as much of Japan is still dealing with the effects of Typhoon Jebi, the strongest such storm to hit the Japanese mainland in 25 years. High winds smashed a tanker into a bridge, forced one of the country’s largest airports to close and left at least 10 people dead. On Japan’s main island of Honshu, nine cities and towns issued compulsory evacuation orders. A further 53 issued non-compulsory evacuation orders. CNN’s Phil Gast and Euan McKirdy contributed to this report.